Hatters interim boss Mick Harford has confirmed the club have offers on the table to sign 'one or two' players ahead of Thursday’s transfer deadline. So far, Town have brought in Derby County midfielder George Thorne until the end of the season, while also signing George Moncur from Barnsley for an undisclosed fee. 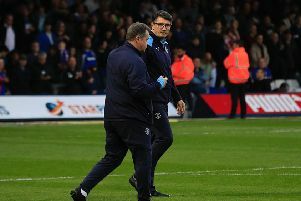 That won’t be the end of the business according to Harford though, who said: “We’ll definitely be looking to enhance the squad before the window closes. “We are looking to bring one or two in, we’re not going to do any business until after the game on Tuesday, then we’ll have 48 hours to try and bring in some of our targets. When asked if he expected the negotiations to run into the night on January 31, with Luton having until 11pm to register their signings, Harford added: “We don’t know, these things nowadays take a long, long time to get over the line if it lingers on. “We’ll look to bring in the right type in, that’s the main thing. "We want to bring the right type into the environment that we’ve got.